These brownies with Rice Krispies are delicious and easy to make. Mix crushed cereal, sugar, flour, cocoa, salt and nuts. Then add oil, eggs and milk. Mix until combined and then spread evenly in a greased 8" x 8" baking pan. Bake at 350F for about 15 minutes until a skewer inserted in the centre comes out clean. Do not over bake. Cool completely on a wire rack before cutting into squares. Store in a tight covered container at room temperature. This recipe is slightly adapted from this site. This holiday season Kellogg's Rice Krispies cereal has teamed up withe Lisa Sangeuedolce, a top Canadian cake decorator to create dazzling homemade gift ideas on a tiny budget. Lisa's signature Kellogg's Rice Krispies cereal holiday ornaments put a fancy twist on Rice Krispies square. Join Kellogg's on Facebook and see a variety of ideas to make delicious treats. Dunkin Donuts packaged coffee will have their new gingerbread cookie flavoured coffee and other seasonal varieties of coffees such as pumpkin spice and mocha mint available for a limited time to celebrate this festive season. Select bags of Dunkin Donuts seasonal coffees include paper gift tags that make it easy for us to take it as hostess gifts or holiday treats. 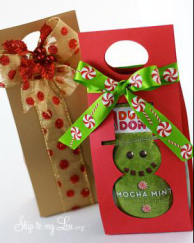 Dunkin Donuts has partnered with Cindy Hopper, a craft blogger to come up with these creative gift wrapping ideas. Let the gift and wrapping compliment one another. i.e. place a bag on gingerbread cookie coffee from Dunkin Donuts in a cookie jar, or serve Mocha Mint with a favourite chocolate bar. Make packaging playful and add a small toy i.e. jump rope as ribbon or jingle bells to the top of the gift. Use blown up balloons or colourful tissue paper to make it eye-catching when the recipients open their package. Use palin paper and put prints, or use newspaper comics, wallpaper scraps or even pages from an old atlas or map to make a memorable gift wrap. Add fresh flowers, shells, misletoe when wrapping the gifts. Instead of cardboard box use decorative tins, hat boxes or fruit crates. 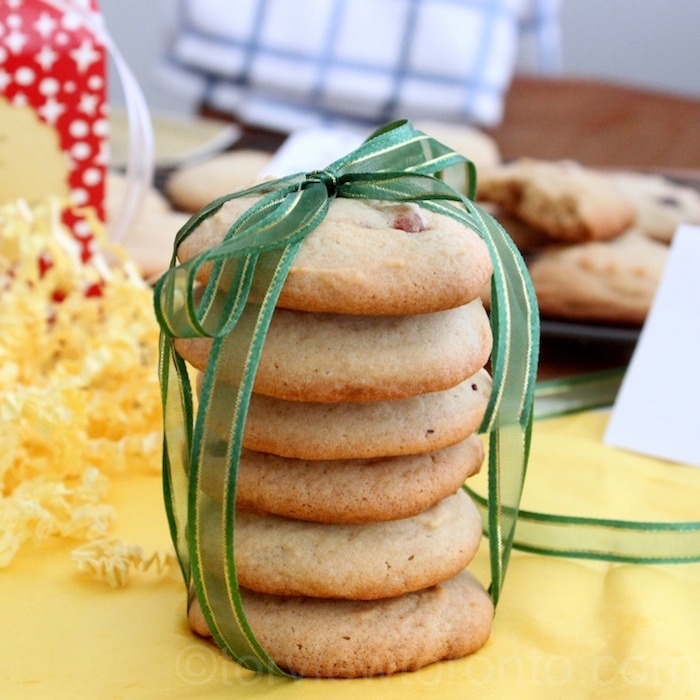 Focus on the gift tag and use items like recipe cards, lugagae tag or coasters to identify the gift recipients. Eid Mubarak everyone. Here is a golden sheet cake recipe I made for Eid. The recipe is adapted from The Smitten Kitchen Cookbook. *I measured all ingredients in a weighing scale and reduced the amount of sugar by about 2 to 3 tbsp; just because my family doesn't like cakes that are too sweet. Next time I will be reducing the butter by a couple of tbsp as well. ** I used vanilla infused sugar and omitted the vanilla extract. Spread the batter evenly in a 9"x13" baking pan prepared with parchment paper that is coated with butter or cooking spray or muffin tray (makes 24). Bake at 350F for 30 to 40 minutes until the cake tested with a skewer comes out clean. Cool the cake in the pan on a rack for 10 minutes then discard the parchment paper and cool completely for about an hour before frosting the cake with buttercream icing. The Smitten Kitchen Cookbook is written by food blogger, Deb Perelman. Deb started her kitchen adventure in her tiny kitchen in Manhattan and documented it in her blog Smitten Kitchen. She has adapted her recipes for the everyday cook, as the recipes use less time to prepare, few ingredients and costs less. This cookbook has over 100 recipes that are easy to follow, which is separated into breakfast, salads, sandwich/tart/pizzas, vegetarian dishes, non-vegetarian dishes, sweets and party snacks/ drinks. I liked reading the stories that came with each recipe that accompanies delicious pictures. I will be having brunch with Deb, the author in the middle of November; so if you have any questions or comments please email me or leave a comment on this post.